The American Health Council recently welcomed Laura Lanette Obenauf, PA-C, to its Board of Physicians for her outstanding contributions to the medical field. As the owner of Elite Care Home Care in Grand Rapids, Mich., Ms. Obenauf works with patients in their homes and develops care plans for each one. In addition to that role — which she has held for over a year — Ms. Obenauf is also an attending physician assistant-certified at Mercy Health Physician Partners, where she has spent more than 10 years working with patients. During her 17-year career in the healthcare field, Ms. Obenauf has gained skills and knowledge in palliative and supportive care, home care, advocacy, compassion, and coordinated care. Ms. Obenauf was inspired to work in the medical field when she was eight years old, when she has surgery to correct a genetic renal abnormality. Dr. King, the attending physician on her case and surgeon at Duke University Hospital, positively impacted her after performing this life-changing surgery. The experience seeded inspiration in Ms. Obenauf to pursue a profession where she could help others in the same manner that she received care. Her inspiration reached fruition after she earned a Master’s in Physician Assistant Studies degree from the Western Michigan University in 2002. 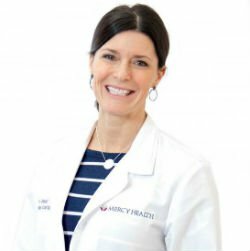 Ms. Obenauf eventually landed at Mercy Health Physician Partners in 2008, where she applied her skills and academic training to aid her patients. She communicates, advocates, and incorporates collaborative care, resulting in improved client quality of life and reduced hospitalizations. She later became co-owner of Elite Care, where she continues to administer high-quality care. Elite Care is a home care company that strives to provide exceptional client-centered care with a mission to maximize each client’s dignity, independence, and quality of life through a comprehensive care model inclusive of the client’s medical and social support system. Throughout her career, Ms. Obenauf mentored physician assistant students and assisted in the development and growth of the Palliative Care program at Mercy Health Physician Partners. She has received several letters of appreciation from patients and their families, a gesture she considers to be an honor. She is an active member of the Michigan Academy of Physician Assistants, the American Academy of Physician Assistants, the Center to Advance Palliative Care, and the American Academy of Hospice and Palliative Medicine. Additionally, Ms. Obenauf contributes to Relay for Life, Kids Food Basket, World Vision, Feeding America, and Bethany Christian Services. In her free time, she loves attending her children’s sporting events as well as reading, vacationing, and staying physically active. She especially enjoys date night with her husband and trips to visit her Cuban relatives in Florida. She attributes her success to her husband, children, parents and siblings. Her faith fuels her passion and energy to continue to strive to advocate for her patients and provide top-level care to each person who crosses her path. Ms. Obenauf plans to continue to excel in her career by growing her home care business and extending her education. Elite care is a home care that strives to provide exceptional client-centered care with a mission to maximize each client’s dignity, independence, and quality of life through a comprehensive care model inclusive of the client’s medical and social support system. Elite Care’s skilled nurses provide services in cardiac care, orthopedic care, stroke recovery care, pulmonary care and wound care, among many. Skilled medical professionals provide services in pediatric care and home health aide.